Jake says he wants to go too. I have to be out of town the rest of this week, and the furkids don’t like it. Jake learned years ago what a suitcase means. He gets excited when it is packed. After the death of my father, who was Jake’s first daddy, I had to travel back and forth from his home to take care of legal matters, the house, etc. and Jake traveled too. He loves to ride in a car. Windy was annoyed too, but she isn’t as savvy as Jake. She goes to the door, gets on her hind feet and slaps the door with her front feet. It almost looks like she is grinning at me as she does it. Now, alone in my hotel room, I miss the clatter of toenails on a hardwood floor. 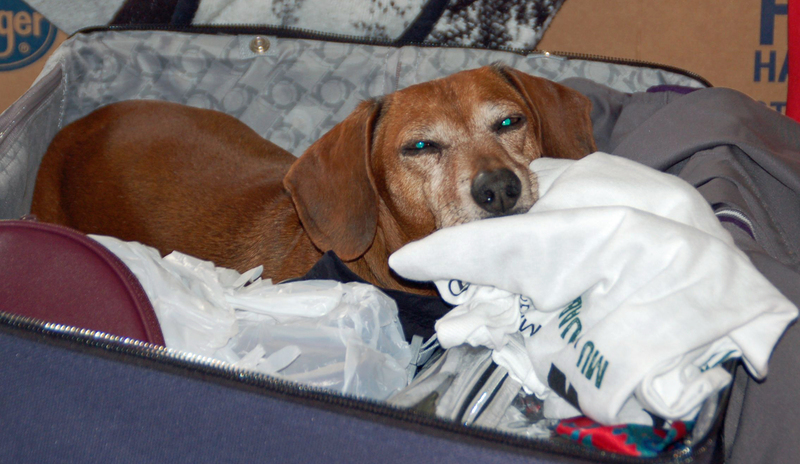 This entry was posted in Dachshunds, Dog Behavior and tagged Dachshunds, Dog Behavior, Traveling. Bookmark the permalink.